Where should this vacuum hose go? I found an unplugged vacuum line near radiator, under turbo bypass valve, which runs around battery and forward toward bumper sort of under headlight. I have no idea what this is for. It wasn't for the headlight washer. Any ideas? * Symptom: Boost gage never reaches orange. Throwing code P1110 with a description of "Turbocharger (TC) bypass valve - range/ performance problem" and cause of "Hose(s), TC bypass solenoid, TC bypass valve". "Anti Hooting Valve" - No idea what to formally call this valve described in this article which exists between the manifold and the turbo bypass valve. http://trolltuner.com/?p=219. I'll call it the Anti Hooting Valve. Would love to know what to actually call it. Colors below refer to the diagram in that link. Ran new (red) line to anti hooting value, from it to to manifold (yellow) and to turbo bypass value (orange). I've got a 2009 9-5 wagon as well and checked that the bypass valve is the same on both so swapped parts. No difference so presumably the BPV is ok. Suggestions on that line? And/or next steps? Thanks in advance to any help anyone might have! The line your thinking of might be the drain hose for the factory style battery used in these cars. If you have boosting problems. First thing I would do is disconnect the hose that goes to the waste gate, see if it will reach proper boost levels, you may feel t7 management cut fuel or close the throttle plate if the boost goes too high. When I had this issue it turned out to be a plugged cat. I am not thinking that hose you are speaking of is a vacuum line either. I think blackls1ttop's comment about the battery drain hose makes sense given the position and routing. Pretty sure I'd noticed it actually in use on this or another of our Saabs when they were younger but had long forgotten about it. Tonight, time and weather permitting, I'll try disconnecting the hose to the wastegate and see if that provides any insight. If the cat was plugged, I would think that I'd not only lose turbo performance but also have pretty poor performance generally. I think this engine feels pretty comparable to my old 96 900S (non turbo) which, absent the turbo, it likely should. I'd also think that I'd likely get additional codes being thrown and increasingly bad performance under load if the flow through the cat was restricted. None of those seem to be occurring. All that said, while I think I have a general understanding of engines and turbos, my specific knowledge and experience is pretty low so there's plenty of room to be surprised by what I don't know! I've never played with the cat/exhaust system. Is there a simple clamp or similar that would make it easy to disconnect and test without those systems connected? Thanks for your help! I've done some limited hands-on routine maintenance in recent years but not much since my old 85 900 about a decade ago. I'm having fun. Trying to get this generally well-maintained car into better shape before I put time and money into minor performance improvements and a long list of cosmetic/feature fixes. 112k on it and worth more to me than I could sell it for. Looking forward to it being a nice example. That code means there's something wrong with the "Charge Air Bypass valve" (BOV in a T5, now a CABV), or the solenoid that controls it, or the wiring to that, or the vac hoses to either. Cheapest first step is to replace the hoses if you haven't done that in a long time. 10' of vac host is enough to redo all the lines on the car. I don't think that's your issue though. Most likely would be a bad CABV. You can get a new Saab one for less than $50 from eeuroparts. The valve on the firewall could be sourced from a junkyard or part out here but I've never heard of a bad one. Wiring is also not generally an issue in this area, but you could clean the connector. Once you get rid of the code, see if power returns, and then move to other tests for the wastegate, cat, etc. This was my first step. All 3 vacuum hoses in the referenced diagram are new (rubber - silicone wasn't available at a local store). I don't think that's your issue though. Most likely would be a bad CABV. You can get a new Saab one for less than $50 from eeuroparts. 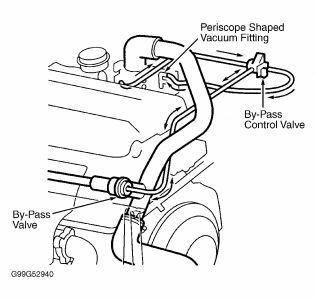 I believe I was calling this the Turbo By-Pass Valve in my original post (which is what SaabSite and the diagram list it as) but which you're referring to as the Charge Air By-Pass Valve I think. I swapped that with my 9-5 (part numbers match) and it didn't resolve it so I think the CABV is ok. The valve on the firewall could be sourced from a junkyard or part out here but I've never heard of a bad one. Wiring is also not generally an issue in this area, but you could clean the connector. The diagram linked above refers to that as the By-Pass Control Valve. I couldn't find the name of this in the first post so was calling it the anti-hooting valve for lack of a better term. Anyway, it was strange. When I started troubleshooting this, I found the lines from it to the CABV and the return line disconnected. Neither appeared to have torn. Neither seemed that bad. I found one reference on another site I didn't bookmark to the bypass control valve having a diaphragm that broke down within it. Maybe? How those lines became disconnected is a bit of a mystery to me. Also, is the "TC bypass solenoid" the same as the "Bypass Control Valve"? http://trolltuner.com/?p=219 which uses a diagram from GenuineSaab. I wonder if it might be a useful diagnostic test whereby I cap the throttle port, then run a line directly from the manifold to the bypass valve. By the logic of that GenuineSaab link, I'd still get boost w/o the Bypass Control Valve. I'm a little wary of this and not suggesting it as a "solution" but it might tell me the Bypass Control Valve is the source of the problem. The solenoid is the control on the firewall. In the T5, the vac line went direct to the Bypass (CABV) valve. In the T7, they found a problem with hooting, so they came up with the solenoid. It varies the vacuum to eliminate the hooting issue. Some guys go direct as the GS link suggests. I tried it. I didn't see any performance change and I lose 2 to 3 mpg, as others have reported. I still don't understand why you'd lose MPG, but it seems common. For you, I'd try to run it stock until you find out what is throwing the code. Get rid of the code and your performance may come back on its own - the ECU tends to limit things when there's a code. A problem with the CABV probably cuts boost to nil since the ECU is not confident it can protect the turbo coming off throttle. Having replaced all vacuum tubes, confirmed the BPV works by swapping another known good one, and having bypassed the solenoid for testing, I cleared the engine fault code and re-tested. No go. As an aside, I didn't know that clearing the code was an important element but it makes sense on some thought so thanks BobSaabit. Still confused why I found two of the vacuum tubes disconnected at the solenoid in the first place but they were overdue for replacement anyway. The good news though was that my 1110 code didn't return. But still no boost. And a new code. P1105. In the last week, I looked into that and found the common issue related to TSB 291-2337 where the turbo pushrod falls off the wastegate valve arm. That was a pain to fix since the arm wouldn't easily swing up but with that complete, we now have boost almost to the red and no code. Thanks for everyone's help in this thread. Onto the next project getting this car all sorted out. A B205L engine runs with about 6-8 psi boost. This is a low pressure engine. When you say orange, I assume you are meaning the top 1/3 of the gauge. A 205L will not normally indicate much over half way up the gauge. The OBD DATA will show the actual boost in PSI or INCHES. The gauge is just a rough indication of relative boost. All you can do with this gauge is look for drastically different readings that might indicate a loss of boost or less likely a large increase in boost. For example, your car runs 1/2 way up all the time, the you get in one day and it won't rise out of the bottom 1/3, it is a safe bet that the boost is low.